Hey folks! I was told today by a very lovely reader that comments on my blog aren't working - apparently it's an issue with some Blogger blogs at the moment. I'll research around and try to find an answer, and I do hope that it will be fixed soon! I'm very sorry if you've tried to leave a comment and gotten an error message! I don't often have smoothies for breakfast. As those of you who follow me on Instagram will know, I'm all about smoothie bowls, avocado toast, oats (both overnight and meal), and Greek yogurt with fruit and granola. When I do make smoothies, they're usually an arvo snack, and they're usually pretty plain and randomly thrown together - frozen banana and other fruit with milk; sometimes a handful of spinach or some peanut butter if I'm feeling wild. Earlier this month, I was lucky enough to receive a box of Late Harvest Blood Cherries from CherryHill Orchards. (You may remember them from my previous post: A Day at CherryHill Orchards). The cherries were incredibly delicious - they were huge, and so sweet and flavourful. These cherries are left on the tree for longer, so they grow bigger and get darker, which apparently means more sweetness and more antioxidants. If you're in Melbourne and are keen to try, they're currently being sold at a pop-up shop in the CBD until Saturday 18th February (details on the CherryHill website). 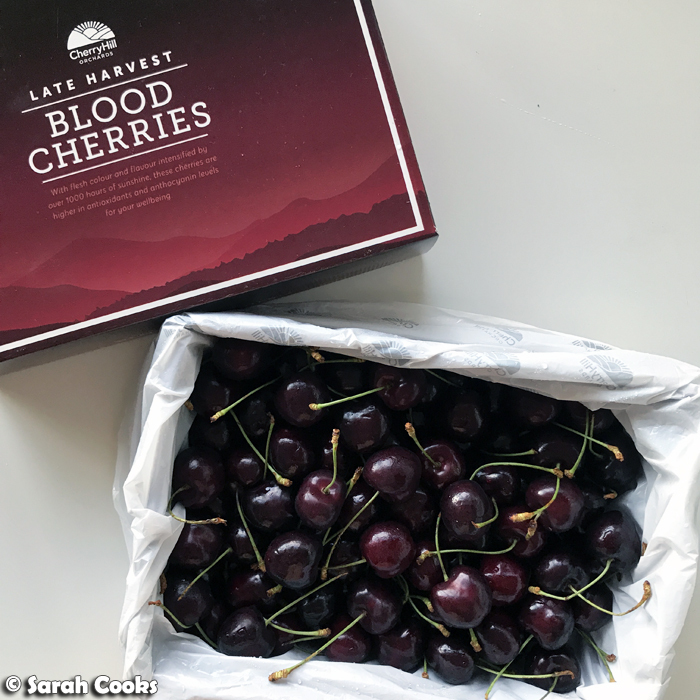 The arrival of this box of cherries reminded me that I still had a few containers of regular-harvest cherries from our visit to the orchard in the freezer, and that I should put them to good use! (When we got those ones back in November, I carefully pitted and packed them away so they wouldn't go to waste before I could eat them all). 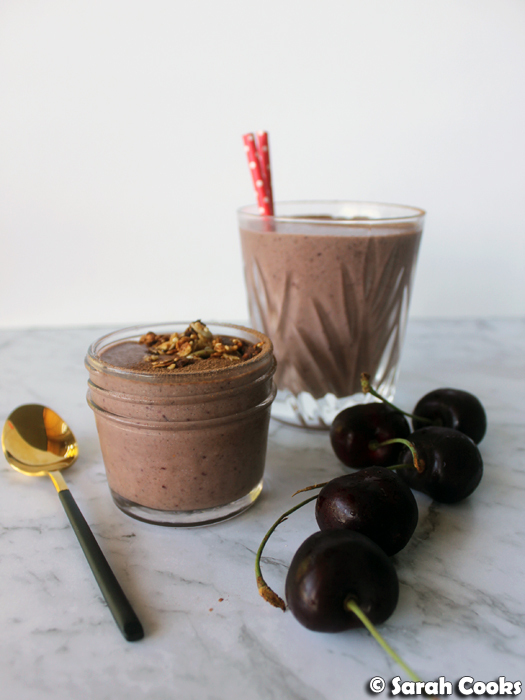 So, I whizzed up some of those frozen cherries with some milk and cocoa powder, a date for sweetness, plus some almonds and chia seeds to add extra nutrients and make the smoothie more substantial. Delicious! It wasn't overly sweet, and had a lovely, natural cherry flavour to it. If you happen to have a glut of cherries, this would be a great way to use them up. 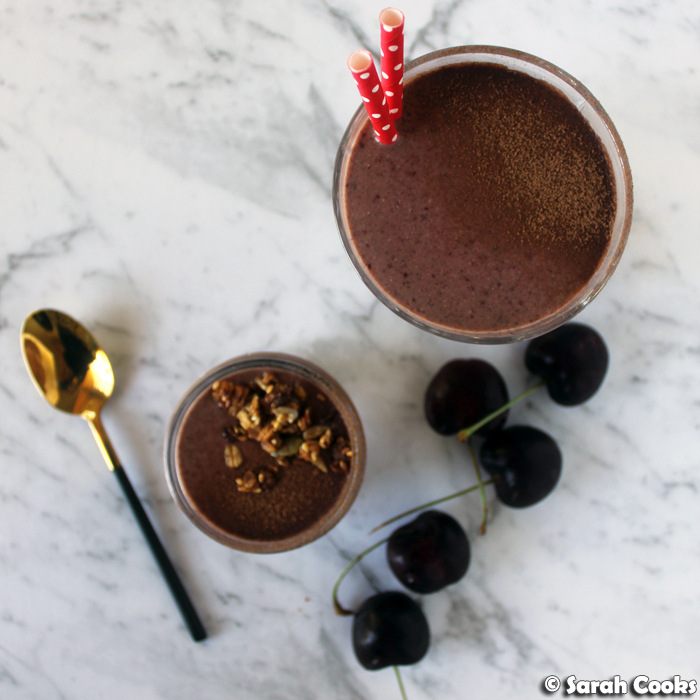 If not, frozen cherries seem to be readily available at the supermarkets - definitely worth getting some to make a smoothie! Enjoy. Place all ingredients in a blender and whizz until combined. Pour into a glass or bowl and top with any toppings you like. Sarah received free Late Harvest Blood Cherries from CherryHill Orchard, but was not obligated to post or compensated in any way. All opinions are my own.